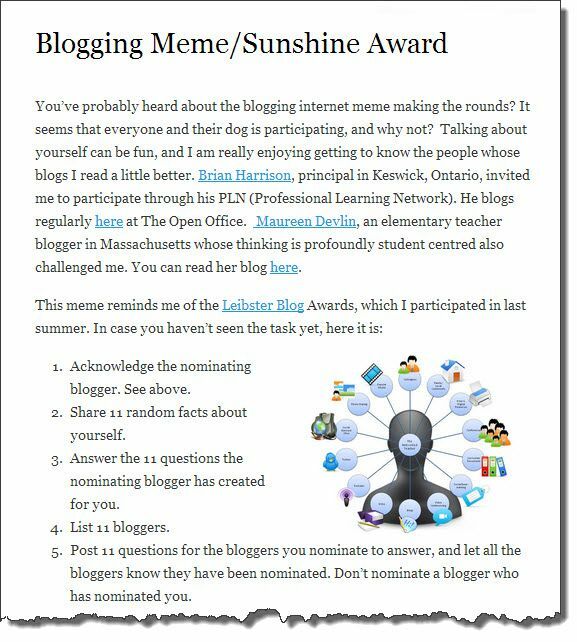 Earlier tonight I was mentioned in Sue Dunlop’s challenge “Blogging Meme/Sunshine Award”. It sounds like a lot of fun and I’m in! Here is her post to set the context…..
First, to Acknowledge Sue. I first met Sue when I was, at the time, the 21st Century Fluencies Consultant for North Cluster in @HWDSB. That title has since been re-branded 21st Century Century Learning and I moved on to a new position (that I’ve held for the past 3 years) entitled Student and Parent Engagement Consultant. When I first met Sue I had been re-commissioned from a Secondary consultant (7-12) to a K-12 Consultant. I had very little knowledge at that time of the elementary world and grew to love it exponentially in the years that would come. I was called to Lake Avenue to support a TLCP with a few grade teams (the grade level escapes me right now). This was one of my first TLCP support visits as a K-12 consultant as I was learning alongside as much as I was supporting. This is what I saw in Sue, as principal, as well. I was in awe of her as a principal as she sat alongside her teachers, rolling her “sleeves up”, and digging into the curriculum, the anticipated learning goals, and the the success criteria needed to get there. We all learned together. We supported each other with the expertise we brought to the table and we learned as a team. That moment sits with me and is not something I have experienced in every support visit I make. For that I thank her and feel honoured to be included in her list for this challenge. I am a huge wrestling fan and travelled this past year to New York to meet over 100 wrestlers and get their autographs – I have over 20 autographed replica championships belts! I have a diploma in graphic design, an honours degree in Anthropology, an honours degree in Classics, a Masters degree in Classics / Archaeology, and a Bachelor of Education degree – 11 years of post graduate studies! I worked with @mrjarbenne to create the HWDSB Commons and one of our first test schools was Delta Secondary School. How many years in education? Teaching and supporting education? This is my tenth year. Do you have a book recommendation for me? Identity Crisis – One of the best DC Comics graphic Novels I have read in some time. Messy desk or clean desk? Messy….and usually full of coffee cups I need to recycle. Usually from me – but sometimes from outside inspiration (like yours). Favourite recipe to make for someone you love? Funniest thing a student ever said to you? Best place you’ve ever had a coffee? I’m not that picky. I love Tim Horton’s. I can say this with even more vigor after I visited Greece and Tunisia and was only able to drink Turkish coffee for weeks on end. I almost ran into traffic to have Horton’s once I got home. I try for once a week but inevitable fall into once a month. My New Year’s Resolution is to redefine how I blog – maybe a pic a day, a small quote, share a link…It’s important to remember that we don’t need to craft a diatribe everytime. When was the last time you attended a performance of Handel’s Messiah? Never – but I’m sure I could YouTube it and watch right now….Ok, I just did! Awesome! Aviva Dunsiger – Living AvivaLoca! Pat Rocco – What Did You Do at School Today? OK – My 11 Questions…. What is your favourite comic book? How many of Hamilton’s waterfalls have you seen? What movie should I watch next? Whose CD is a “must buy”? Do you have a favourite place to hike? Should my family check it out next? Is twerking a real dance move? Does Blackberry really have a chance in today’s market? Can “gamification” in education really work to engage students? So…now it’s your turn. Refer to Sue’s post above and add your 11 facts, responses, questions, and nominees in your next blog post. The comics and wrestling do not surprise me. The Tim’s does – and how can you not like Turkish coffee? Thanks for the whole hearted participation and your kind words. It is quite fun to read others’ random facts and answers to questions.